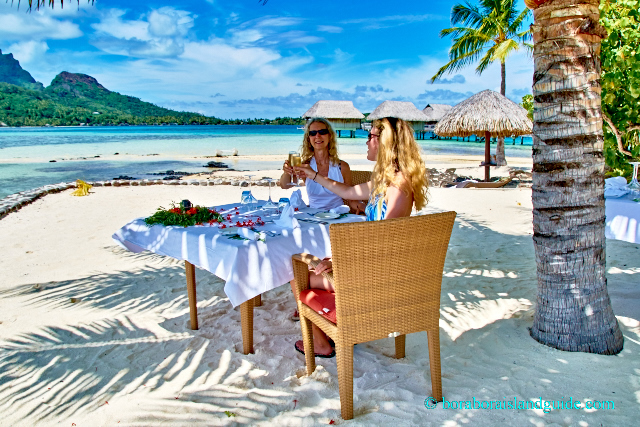 After experiencing the Sofitel Bora Bora private meal for two we know that one of the most romantic ideas on a Tahiti vacation is lingering over a private lunch on the beach. 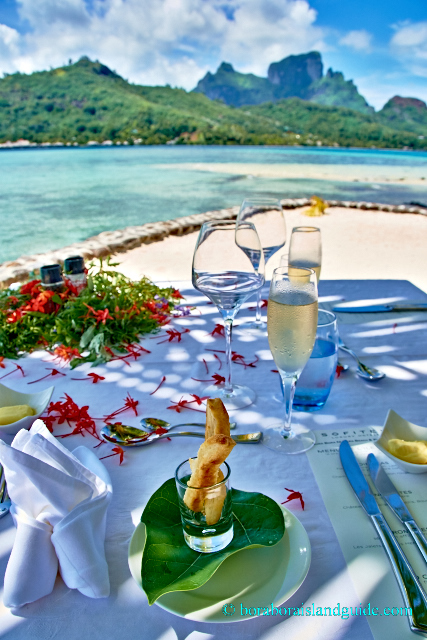 We had the lunch of our lives at the Sofitel Private Island. 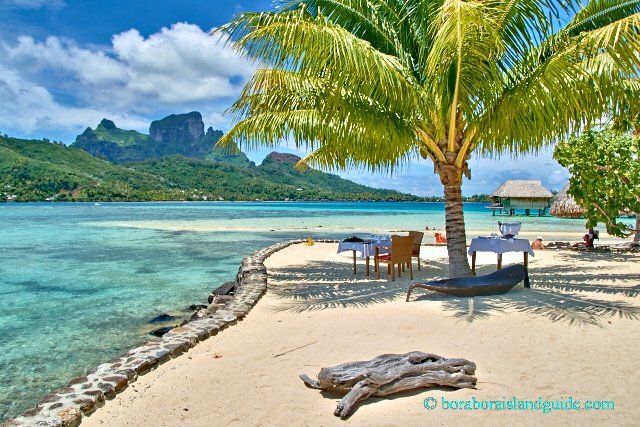 Right on the white sand, under a palm tree, next to the most beautiful lagoon in the world. 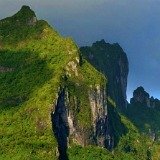 With majestic Mount Otamanu looking on. 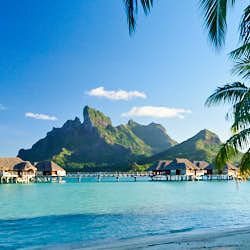 Pure paradise! It was one of those extra-ordinary experiences where you are completely in your senses and enter the time zone of now. Every vibrant detail was perfect! Looking back from the arrival dock, the main island appears very close. 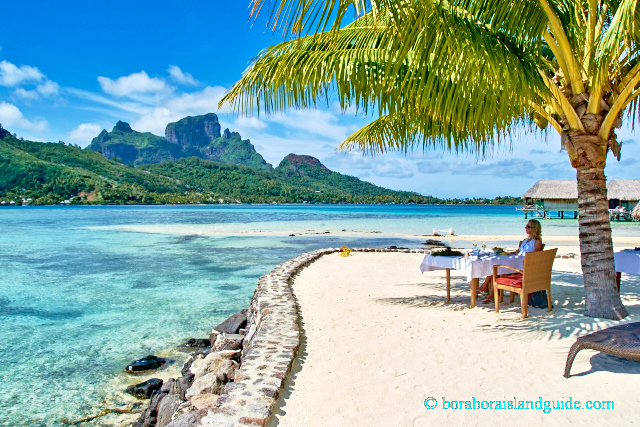 It's only several boat minutes from Sofitel Bora Bora Marara beach to the absolute tranquility of the Private Island. 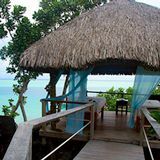 The Sofitel motu is a child-free part of the resort. 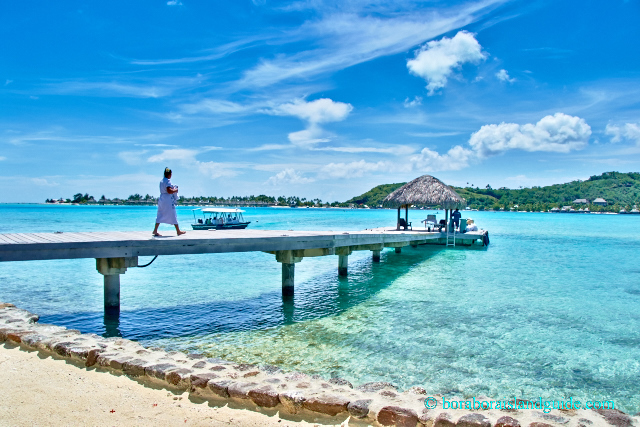 As we stepped onto the sun drenched pier we were warmly greeted with a traditional, Polynesian welcome. Had they mistaken us for queens? Apparently not. 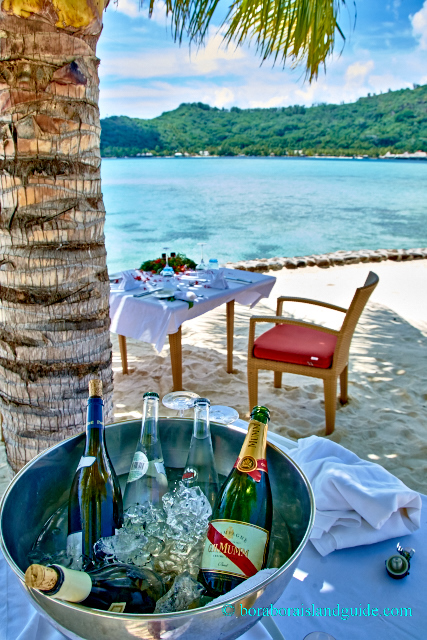 Every guest gets royal treatment here. 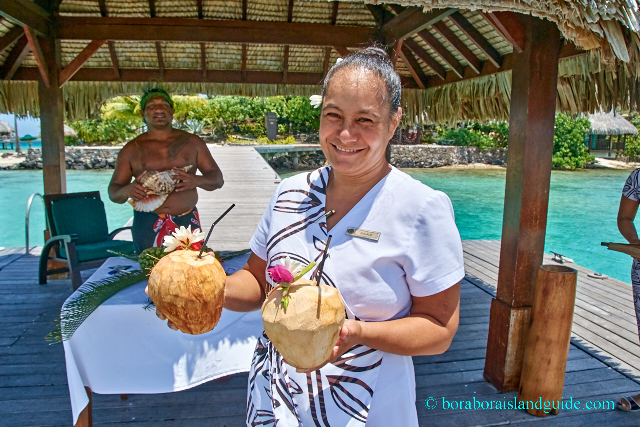 A smiling Tahitian mamma presented us with colorful, coconut cocktails. And a gleaming descendant of a Polynesian warrior heralded our coming with resonating blasts from an impressive conch shell. 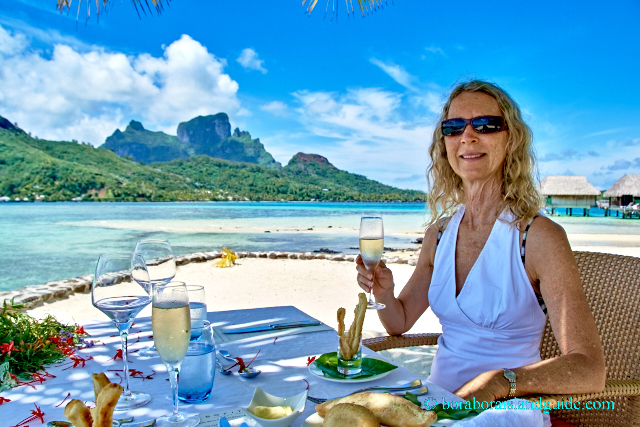 From our first glimpse of the setting for our Sofitel Bora Bora private lunch we realized we were in for a very special treat. We strolled past the ice bucket, discretely tucked behind the palm's textured trunk. Sparkling water. Still water. Champagne. Red wine and white wine. All with very French labels. The finest (in fact, only) seats in the 'restaurant' were ours! 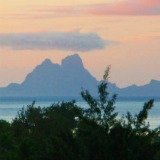 In front of us, across the lagoon, Bora Bora Island was showing off her most celebrated, craggy point, Mt Otemanu. I felt as if I could almost reach out and touch it. We were pinching ourselves! Next we focused our curiosity on the extensive menu. Our bubbly was poured immediately and our grins expanded. 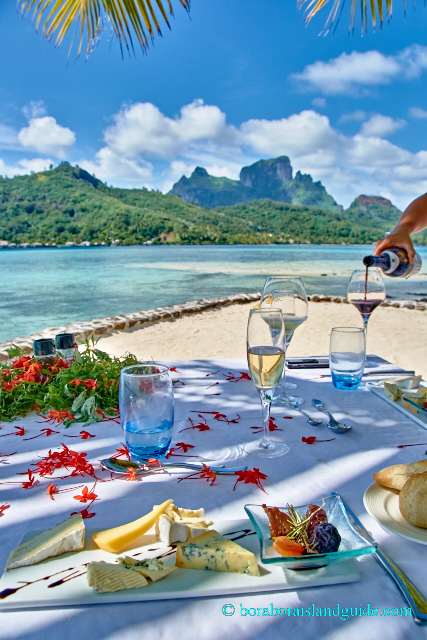 Time for a toast. 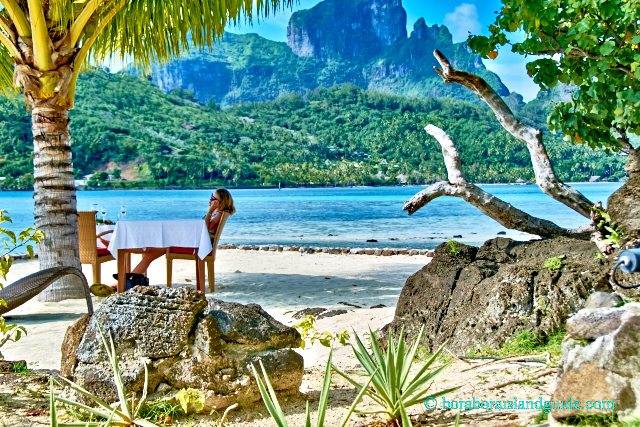 We'd never dined at a restaurant with scenery this amazing! Even Gloria was lost for words. And more cheers, as we took in our floral tablecloth. 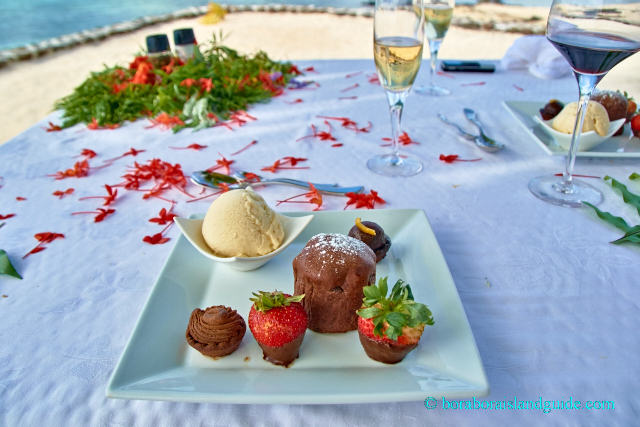 Everywhere we go in Polynesia there's fragrant, fresh, floral decorations. 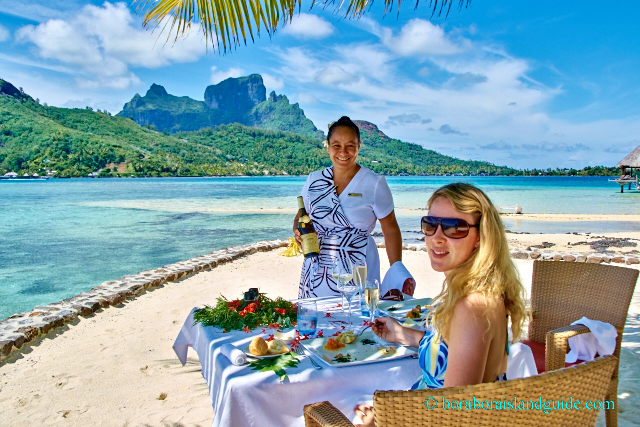 It's an integral factor in creating a Tahiti romantic vacation. 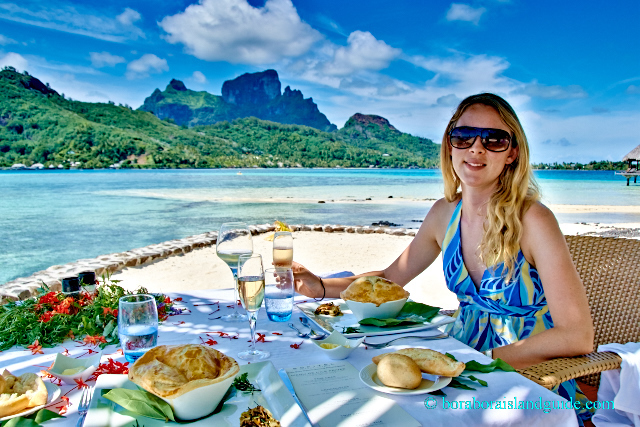 The French influence means that fresh, crispy, bread sticks are one of the most popular foods in Polynesia. The locals have unusually long bread-stick 'mail boxes' at the front of their homes for daily delivery. 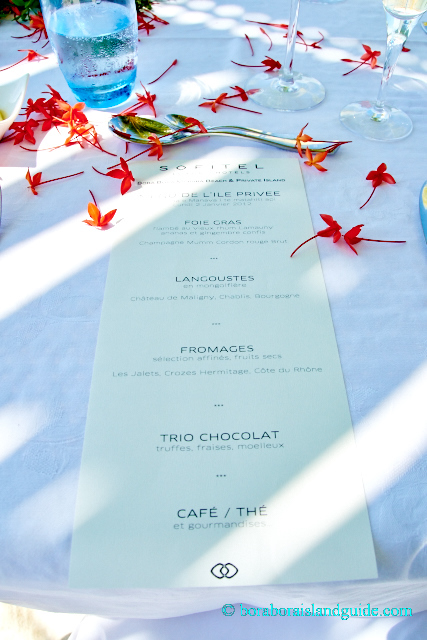 We were still intrigued by the ambiance when our first course arrived. I called upon my limited high school French to assist in translating the written description into the luscious art form on my plate. 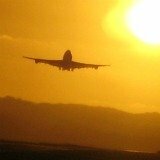 The friendly, island service could not have been better. Our respectful, discreet waitress attended to detail, yet was mostly invisible. So we could enjoy lingering and having an intimate time. 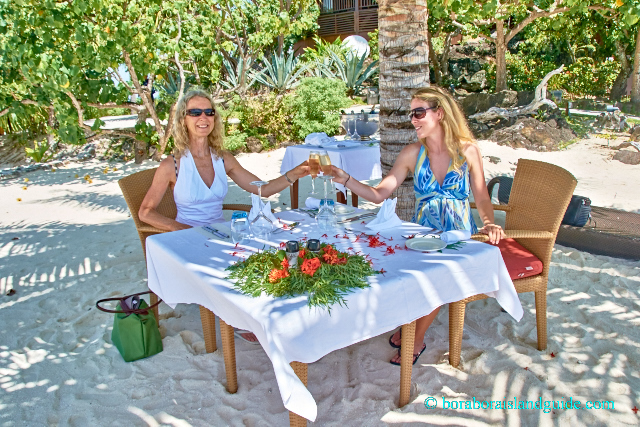 I think we were not the first lucky ones to be served at this table. 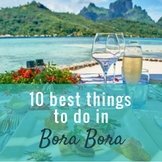 The Sofitel Bora Bora has this memorable, romantic idea mastered. Are we still hungry? Does it matter? No one does dessert like the French! We definitely did not tire of drinking in the view. 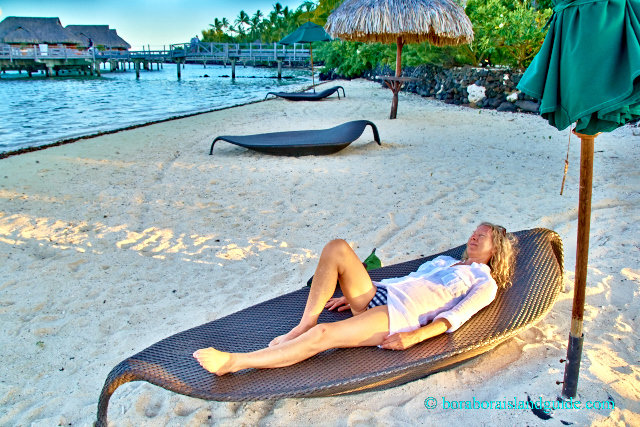 Post lunch is time for some serious napping in Tahiti paradise. 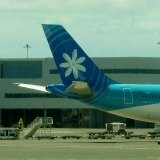 Make sure you switch to relaxing island time before you disembark from your Air Tahiti flight. 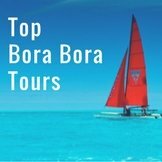 People ask us about the Bora Bora prices. 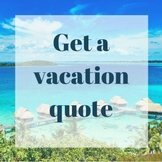 It's true that you can have a cheaper island vacation closer to home. 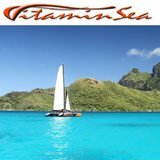 Yet we are avid travelers and where-ever we venture we find ourselves comparing our experiences to those we've had in tantalizing Tahiti. 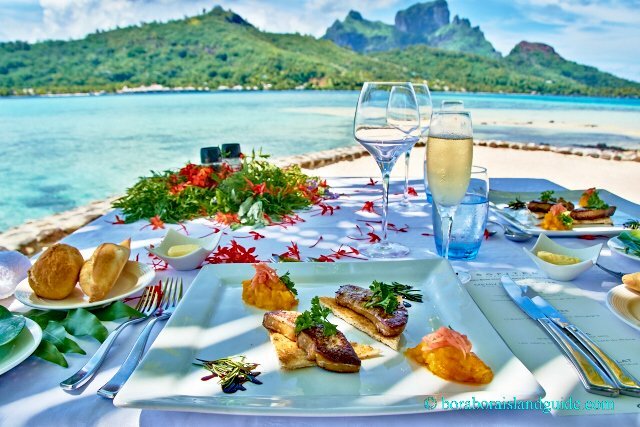 We had the lunch of our lives at the Sofitel Bora Bora. 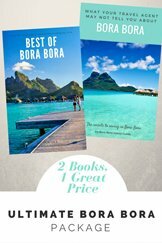 What you pay to enjoy this exclusive, exotic, out-of-your-mundane-world experience is worth every cent of your hard earned money. 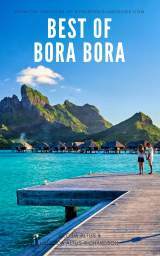 The Bora Bora Sofitel Marara Beach and Private Island is one of the affordable Bora Bora luxury hotels and it's in a superb location. 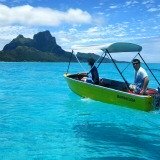 Here's more about why it offers a fantastic Tahiti romantic vacation. 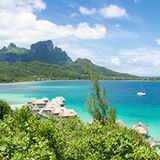 When you are ready to book your Tahiti hotel, you will want to know about the awesome service provided by specialist Tahiti travel agent, Pacific For Less. 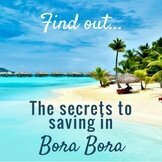 The less is only about what you pay! 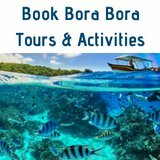 Claudia and Jennifer will do everything possible to ensure that your entire Tahiti travel is superb. 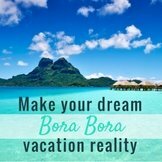 You can call up any time you need help (even on your Bora Bora vacation), and enjoy the best Bora Bora prices.